The Nos. 17/18 Montana Grizzlies moved to 3-1 and opened league play with a win by swatting the talented Sacramento State Hornets at home last week, and now return to the road on week five looking to get a monkey off their backs. The Griz travel to the Golden State on Sept. 29 to take on Cal Poly in San Luis Obispo, a team that has bedeviled UM in recent years with a triple option-based attack that has led to a three-game win streak for the Mustangs and wins in four of the last six meetings dating back to 2013. While Cal Poly enters the game reeling from last week’s trip to Eastern Washington where the Eagles hung 70 points on them, it’s a new week and the Mustangs still have a team led by head coach Tim Walsh and preseason All-America fullback Joe Protheroe, who managed 176 rushing yards in the 70-17 drubbing at EWU. “Any time you play a team where Tim Walsh is the head coach, they’re going to do certain things. They’re going to tackle, they’re going to be physical, they’re going to run the ball, and they’ll be tough to beat,” said Montana head coach Bobby Hauck. The Mustangs make no bones about the fact they like to run the ball, either. Of the 124 teams in FCS football, Cal Poly enters the game ranked No. 119 in passing but No. 13 in rushing offense, and Protheroe enters the game as the Big Sky’s second-leading rusher, averaging 130.2 yards so far this season. But after last week’s game against Sac. State, the Grizzlies seem to have developed a run game of their own, climbing from No. 90 to No. 50 in the nation in rushing offense thanks in part to 206 yards from QB Dalton Sneed, who earned Big Sky Player of the Week honors with 440 yards of total offense. As a whole, the Grizzlies more than doubled their season output of rushing yards against Sac State. UM had run for a total of 332 yards heading into the game against the Hornets, where Sneed led them in producing 376 yards on the ground in a single outing. With the Mustangs ranked No. 116 in the nation in rush defense after last week’s gashing by EWU, and Montana’s young offensive line maturing by the day, the Grizzlies seem to have added another arrow to their quiver. TAILGATE TIME: Montana fans will get the chance to whoop it up with Cal Poly fans prior to the game at the official Mustang Corral BBQ tailgate party. Tickets to the tailgate are $25 and include food, beverages and music. To buy tickets, click here. THE GAME: Montana moved up to Nos. 17/18 in the national polls this week. With Cal Poly currently out of the national ranking picture at 1-3, Montana is not looking for an upset on paper but will be looking to evict memories of a tough loss at Alex G. Spanos stadium in 2016. Montana set a pair of school records the last time they visited Cal Poly, with Jerry Louie-McGee bursting onto the national scene with 21 catches, and quarterback Brady Gustafson breaking one of Dave Dickenson’s school records with 47 pass completions. Despite the video game-like numbers, it was a pass from the Mustang’s run-first attack that undid the Grizzlies as quarterback Dano Graves hit Kyle Lewis over the top for a 39-yard touchdown that put them up for good, 42-41. The Griz would erase that memory and could retain at least a share of the Big Sky Conference lead with the key road win. They would also get back on the winning track away from home, where they have not had a winning season since 2013. Kickoff from Spanos Stadium is set for 5:05 p.m. (MT), 4:05 local time. WATCH: The Montana/Cal Poly game will be telecast by Big Sky Conference broadcast partner Eleven Sports Network on Saturday. Eleven Sports is available nationwide on DirecTV Channel 623, part of the “sports package” that has over 3.1 million subscribers. Eleven Sports is also available to over 55 million viewers on AT&T U-verse, Verizon FiOS, and Google Fiber. For fans without DirecTV, the Montana/Cal Poly game is also available to stream for FREE at WatchBigSky.com or via the PlutoTV app. Bill Doleman will provide the play-by-play of the Eleven Sports Broadcast. LISTEN: “Voice of the Griz” Riley Corcoran and Greg Sundberg will bring you the action live from San Luis Obispo on the Grizzly Sports Radio Network. HOME SWEET HOME: Montana celebrated its 200th win inside the friendly confines of Washington-Grizzly Stadium last week against Sac. State. UM now has a 200-30 record at home since the facility was built in 1986, an 86.9 win percentage. Montana also extended its unbeaten streak at home against Sac State to 12-straight games. UM has never lost to the Hornets in Missoula, and is now 20-1 all-time against them. OTHER MILESTONES: At 98-68, coach Hauck is just two wins away from crossing the 100-win mark on his career. THE NEED FOR SNEED: Sneed earned the ROOT Sports Big Sky Offensive Player of the Week award this week after his dynamic performance against the Hornets with 206 rushing yards, three TDs, and 234 passing yards for 440 yards of total offense. Sneed is ranked No. 3 in the nation in total offensive production, averaging 340 yards per game, and No. 8 in the FCS in points responsible for (66). Sneed’s was the third Player of the Week honor for UM this season, with Dante Olson earning back-to-back Defensive awards following weeks one and two. The last time a Grizzly rushed for 200 yards was Jordan Canada in 2014 at Southern Utah, where he picked up 211 yards on the ground. The last Grizzly to rush for three touchdowns was Jeremy Calhoun in 2015 against Eastern Washington. Sneed was only 60 yards of total offense away from eclipsing the rarest of Grizzly offensive milestones, the 500-yard mark. The last Grizzly to rack up more than 500 yards of total offense in a game was Brian Ah Yat in 1996. UNBELIEVABLE OLSON: Dante Olson could have potentially earned his third Player of the Week award following his performance against Sac State where he put in a total of 15 tackles, just one shy of tying his career high he set on week two. He is now ranked No. 3 in FCS football and No. 1 in the Big Sky with 55 tackles this season. He’s also ranked No. 18 in the FCS in sacks and No. 23 in TFLs. He’s also nationally ranked in passes defended and interceptions. KEEPING IT CLEAN: Going into the Sac State game, Montana has totaled 26 penalties in three games, an average of over eight per contest. Against the Hornets, however, they gave up only three penalties compared to Sac State’s eight. FRESH FACES: Montana’s extremely young roster can’t be overlooked in 2018, with 16 freshmen and 12 sophomores listed on the two-deep this week. 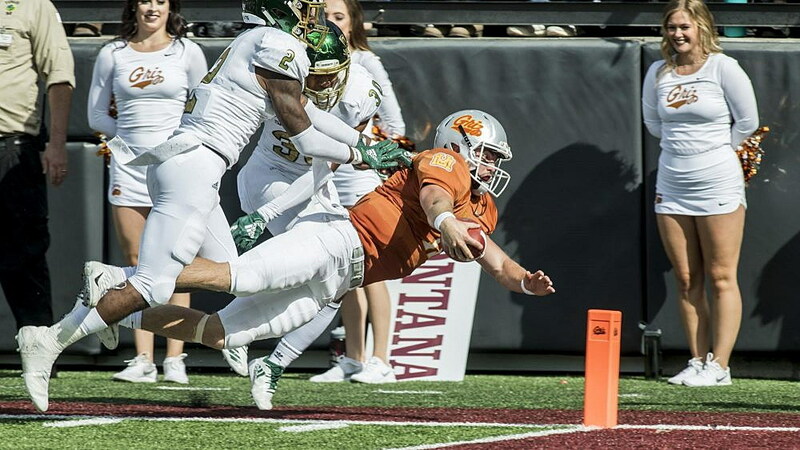 True freshman Gabe Sulser from Billings took an end-around 53 yards to the house against Sac State to score on his first-ever touch of the ball in a college football game. Senior defensive tackle David Shaw doubled his previous career high tackle total against Sac State, totaling eight takedowns against the Hornets. His previous career high was four tackles in a game. Sophomore linebacker Jace Lewis set a new career high with six tackles against the Hornets as well. Kicker Adam Wilson posted a new career high with five touchbacks in eight attempts. After blowing up for 21 catches at Cal Poly two years ago, Louie-McGee is inching closer to becoming UM’s all-time leader in pass receptions, entering the top-10 this week with 159 in his career. The junior caught six passes against Sac State to pass Brian Salonen (80-83), Ryan Bagley (04-07), and Bill Cockhill (90-93) on the list. Louie-McGee and senior receiver Keenan Curran are neck-and-neck as they move up the all-time receiving yards list, with Curran sitting at No. 22 with 1,719 and Louie-McGee close behind with 1,661 career yards. Linebacker Josh Buss set a new career high with three sacks against Sac State last week, putting him at No. 12 on UM’s all-time sack leader list ahead of Ciche Pitcher. Buss moved up to No. 7 on UM’s all-time tackle for loss leaderboard with 41.5 to his name. He passed Griz legend Jason Crebo to move to No. 7 and is now chasing Andy Petek career mark of 44 TFLs. With a pair of field goals against Sac State, junior kicker Tim Semenza has crossed the threshold of minimum attempts to be in the conversation for the best field goal percentage in UM history. With 22 makes on 26 attempts, Semenza now has an 84.62 FG%, the best average in program history. Sneed set a new record for the most rushing yards by a QB in program history against Sac State and moved into a tie for 11th for the longest TD run in UM history with a 75-yard score. The longest TD run in UM history? Jon Nguyen’s 81 yards, which he set against the same Sac State Hornets in 2016. LEGEND OF THE FALL: The University of Montana and The National Football Foundation (NFF) & College Hall of Fame honored 2018 Hall of Fame electee Dave Dickenson with an On-Campus Salute, presented by Fidelity Investments at the home game against Sac State on Sept. 22. The Grizzlies honored Dave by wearing their throwback copper and gold uniforms, and limited-edition copper and gold apparel with his retired number 15 on it were made available to mark the occasion. Dickenson will donate a portion of the proceeds from the sale of the gear that bears his name to a Grizzly football scholarship. IT’S STILL A BIG DEAL: Just how significant is Dickenson’s induction into the Hall of Fame? Consider: Only 997 players and 217 coaches have been inducted into the College Football Hall of Fame (Including the 2018 class) from the nearly 5.33 million people who have played or coached the game over the past 149 years. Dickenson is only the second player from Montana to enter the Hall of Fame behind Bill Kelly in the early part of the century and is the only FCS/D1-AA player to be inducted in the class of 2018. Stop. The. Run. With Cal Poly’s triple option a proven weapon against the Grizzlies, Montana will need to put extra effort into the run game this week. Sac State’s Elijah Dotson torched UM for 234 yards on the ground in UM’s 41-34 win. The last person to rush for 200 yards against the Grizzlies? Cal Poly quarterback Chris Brown who ran circles around UM in San Luis Obispo with 226 yards on the ground in 2014, a 41-21 loss for the Griz. Montana will have its hands full with more than Protheroe this week. Junior slotback J’uan Campbell scored both of Poly’s TDs against EWU last week from 5 and 39-yards out in the second and third quarters, rushing for 48 total yards on just five carries. Placekicker Casy Sublette is the only Mustang to return to this year’s squad who earned All-Big Sky honors last season. Cal Poly picked up its first win of the year over Brown on week three, defeating the Ivy-Leaguers 44-15 at Cal Poly. Protheroe set new career highs with 43 carries for 228 yards and three touchdowns in the win. The Mustangs were dealt heavy losses by NDSU on week one (3-49) and EWU on week 4 (14-70), but hung tough with Weber State at home, falling 17-24. Montana returns home to face Portland State on Oct. 6 for Homecoming.